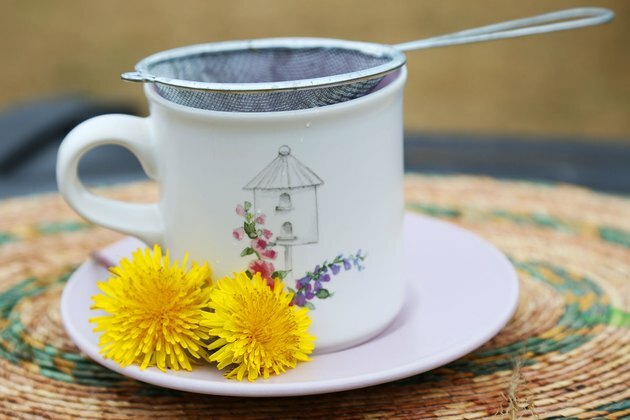 Dandelion root tea works to stimulate appetite and aid digestion, and can be brewed from dried or fresh roots on your stovetop. 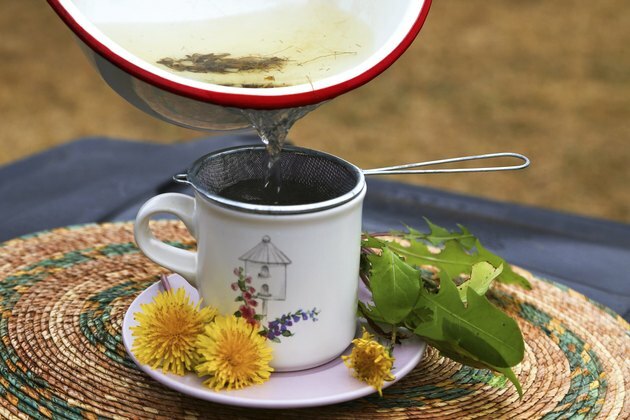 If you make the herbal tea with fresh dandelion root, you'll likely find no shortage of the weedy plant in your own backyard. You can also use dried dandelion, whether from your own foraged dandelions, or from roots obtained at a health food store. 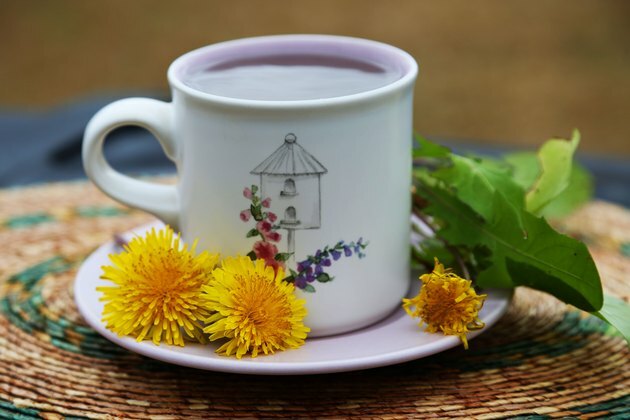 While dandelion root tea is considered safe for most people, it's always best to ask your doctor before using either dried or fresh root as an herbal tea. 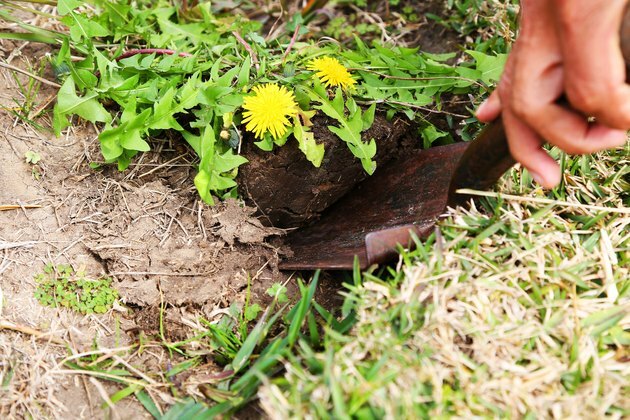 Dig up as much of a dandelion plant as you can get with a deep spade or a dandelion fork. The plant's taproot is quite long and twisted, so it can take some effort to unearth the entire plant. Separate the root from the leaves, stems and flowers, and rinse the root vigorously under cool running water. Save the leaves for another use, if desired. 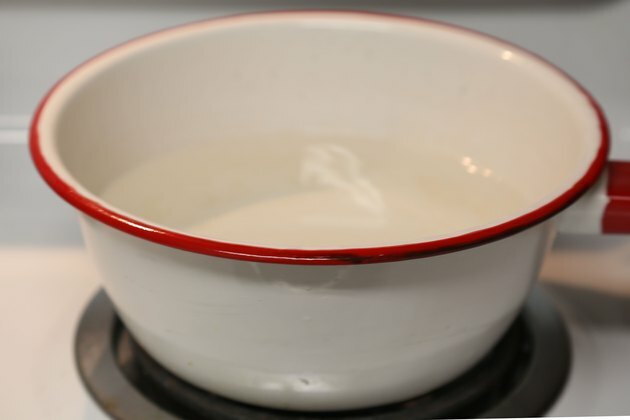 Bring 1 quart of water to boil in a saucepan. 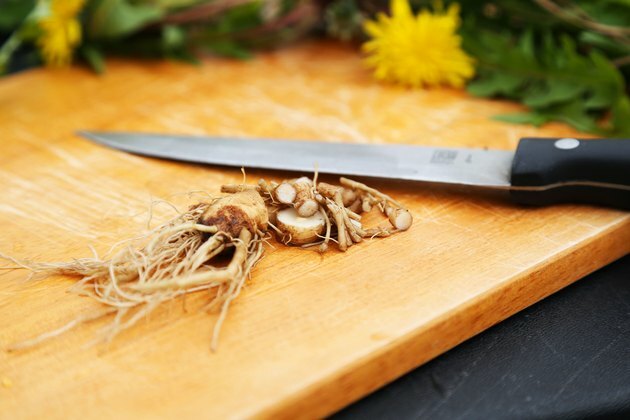 Chop dandelion root coarsely. Add 2 teaspoons of the chopped root to the saucepan, cover the pan and lower the heat. 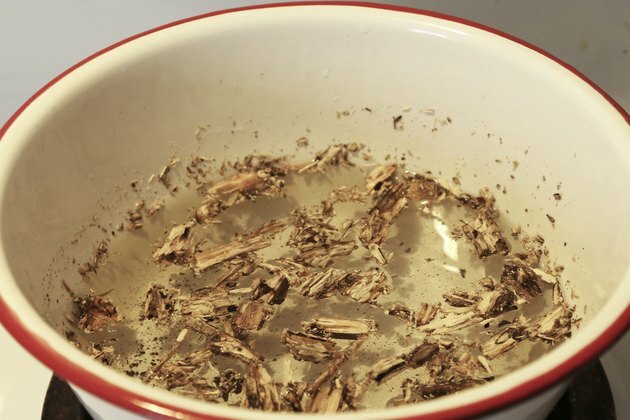 Simmer the dandelion root in the covered saucepan for about 1 minute. Remove the pan from the heat. 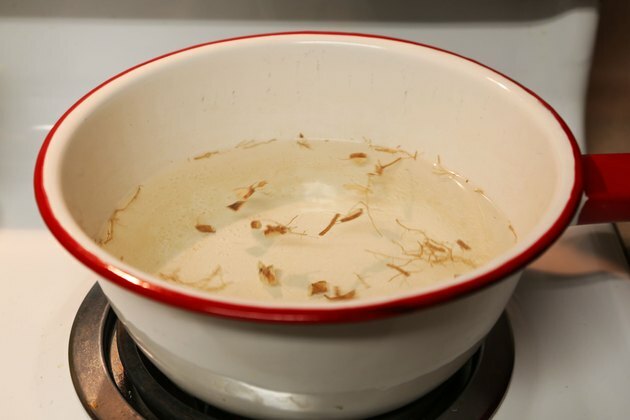 Leave the dandelion root to steep in the covered pan for 40 minutes. Set a strainer over a teapot, and pour the infused liquid into the pot. Discard the root pieces. Chop 1/2 to 2 teaspoons dried root. Place the root pieces in the saucepan, and leave the water at a boil for 5 to 10 minutes. 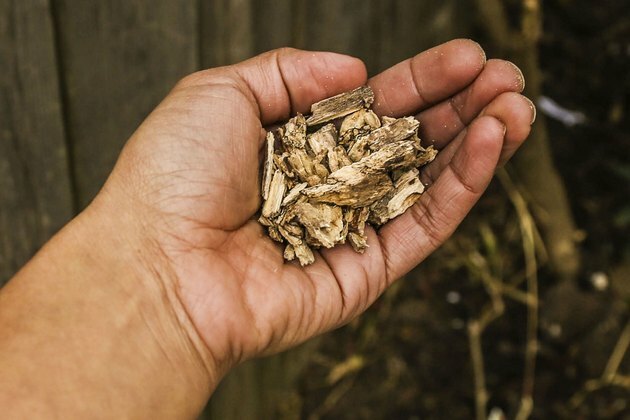 Dried dandelion root is woodier than freshly-dug root pieces. For that reason, dried root tea comes from a decoction of the dried root set in boiling water for at least 5 minutes, while fresh roots can be slowly infused in simmering water. 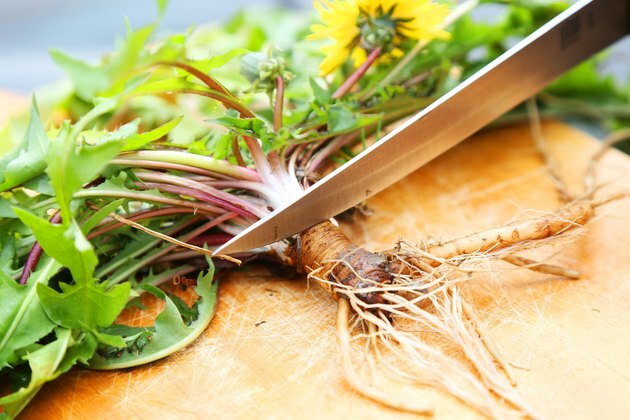 For additional nutrients, add chopped leaves to chopped roots when you're using fresh dandelion plants for tea. 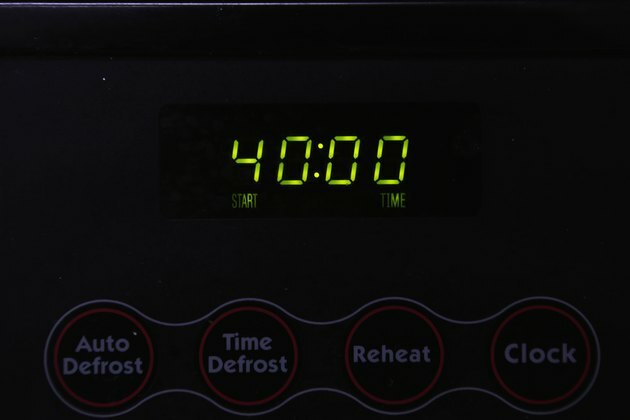 After you remove the saucepan with the roots from the heat, add 2 teaspoons chopped, cleaned dandelion leaves, and replace the lid while the tea continues to steep. Never dig up dandelion plants from an unfamiliar park or neighborhood lawn. Unless you know otherwise, it's safest to assume the area in which the dandelions are growing has been treated with pesticides. Talk to your physician about possible interactions with prescriptions or pre-existing conditions. For example, because dandelion stimulates bile, people with blocked bile ducts or gall bladder issues may need to avoid the herb.